We see it all the time. The cleaning process for commercial property includes the grass, landscaping and parking lot. There may be carpet cleaning, roof inspections and air conditioning maintenance. But the windows – hardly ever. The windows are as important as all the other items on this list. 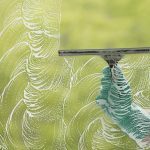 Not only does regular window cleaning keep your commercial facility windows crystal clear, but it also helps to keep spider webs, dust, debris and the fallout from bird impacts on your windows at a minimum. And it makes your tenants happy. That’s important when it comes to lease-renewal time. 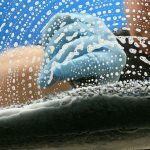 Regular window cleaning can also help with damage that can occur to your windows. A number of environmental factors can permanently damage your windows. These include hard water stains from concrete leaching. Many commercial buildings are built with concrete or brick on the same vertical plane as the windows. As time goes by, calcium and other minerals used in the manufacturing process of that concrete or brick leach out of a building’s walls. 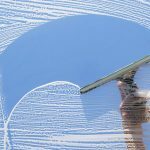 So there are lots of reasons for keeping those windows clean. If your maintenance crew is already overwhelmed, look to a professional like Green Clean Window Cleaning for help.